One of the most important factors while designing your kitchen is the kitchen shelves. They have to serve the purpose and also appear trendy. 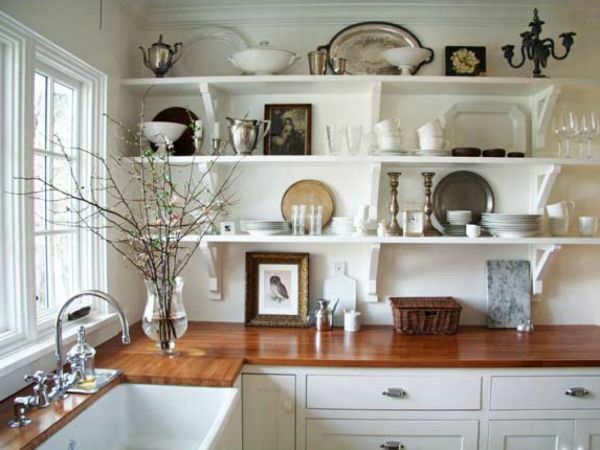 These days there is a growing rage for vintage inspired kitchen shelves. They look great and also very useful. Vintage inspired shelves look great and you can stack plenty of things. Vintage kitchen ideas usually include open shelves design, and country kitchens.In the open shelves design all the lovely things that you have in your kitchen can be displayed. However, the drawback is that you cannot keep it messy. It needs to be clean and everything has to be well arranged. Another form of designer kitchens is the country kitchens. These have a traditional look. They look elegant with all the lovely lighting, graceful cabinets,beautiful painting etc. A lovely C-shaped kitchen platform with an island in the centre look good and also provides ample work space.Adorn the walls with closed cabinets. You can have glass doors for few cabinets so that you can display your crockery. Small stools can be used for sitting. Make use of traditional and subtle colours for the wall. 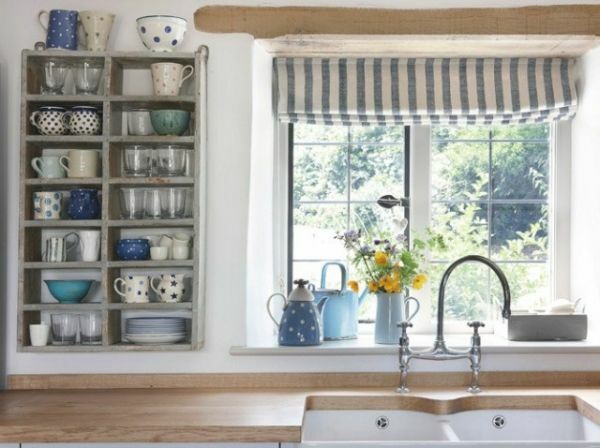 You can go for a complete country kitchen format. Opt for a traditional look for the doors of the cabinet door. Go for colours like white and beige for the cabinets. Have a wooden centre table. You can make use of traditional looking small benches around the centre table. 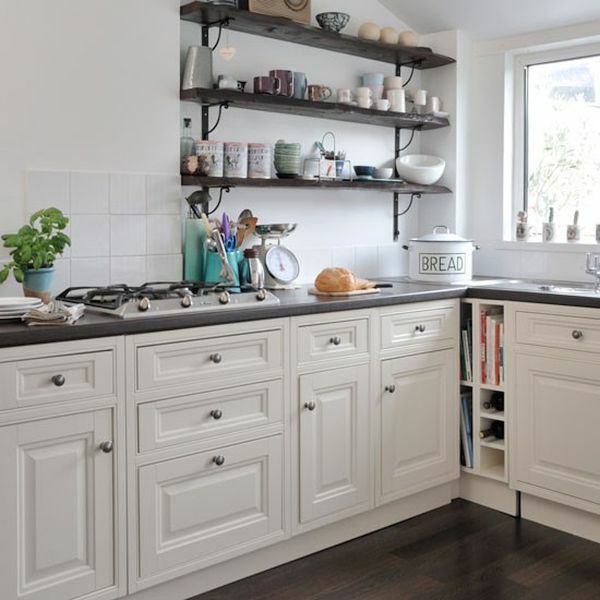 Opt for small open shelves around the kitchen walls. A centrepiece like a hanging candle stands which reminds one of the old times can be used. Go for complete antique looking furniture for the kitchen. Right from the cabinets and open shelves to the centre table all should be antique. The chairs and stools should also have an antique look.Put some brass or metal wall pieces. Make use of vintage lamps for the lighting. Make use of the vertical wall space. You can have metal shelves and display platters and wine glasses as accessories. Keep all the shelves and wall paint completely white. Stack the kitchens with accessories which have darker shades like a wooden bowl, bamboo cutting boards of darker colours etc. For better use of space get rid of the upper cabinets and install open shelves. Display all the attractive and nice looking accessories on these open shelves. You can group the accessories based on the colour,use,size etc. Place heavy items on the lower shelves and lighter goods on the upper shelves. Go in for wooden flooring and the table cloths and table mats can have floral designs.You can also display some old goods like old wooden bowls and brass vessels along with modern gadgets and crockery. Vintage kitchens help in proper utilisation of space and also as mentioned earlier are a unique amalgamation of traditional look and contemporary style. Just go in for the best and unique vintage ideas to decorate your kitchen.